I stripped the lead keel out of about ? 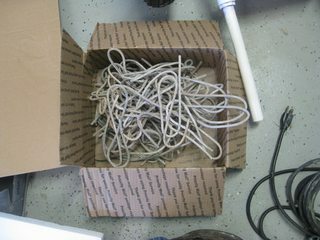 feet of air line used to connect a diffuser to a compressor. Would be great to melt down and use for lead sinkers. I promised it to someone here about a year ago and finally got around to stripping it. Unfortunately I can't find the post or the message on who it was. If it was you get in contact with me. If not, it's first come first serve. All I ask is to reimburse me for shipping once you get it. I'd ship the cheapest way. Box is fairly small and since the major shippers go more by dimensions now it shouldn't be too much. I just don't want this to have this end up in a landfill and if you mold jigs, sinkers etc. it could last you a while! many scrap yards recycle metal they may take it if you cant find someone to take it. How many pounds is it and how big a box would you mail it in? these posts crack me up. lol I have made a couple over the years. that mite be good enough for casting bullets also! chunked in appropriate length, they would make some killer home defense shotgun loads too! Well ya know we all skim posts from time to time and miss the obvious! And big chunks of lead for the Great Blue Herons would be an option but my federal and state permits say I have to stick to steel shot. seems there aren't any recipes for crane on the net. you could start an entire new first of its kind cook book! 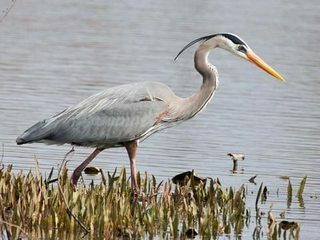 Now Fishhogger Great Blue Herons are not cranes! And I'm not allowed to do anything with the carcass, I'm supposed to bury it. 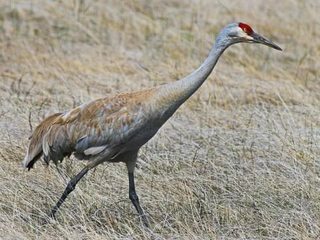 I know there is such thing as Sandhill Crane hunting. Not sure if these are the same ones you are seeing Taxid but if it is and somehow the breast ends up on the grill, treat it like roast beef and goose. I know the removal of these cranes is crucial to your operation and your permit says bury them whole but, I would have a hard time just tossing something edible. The birds I deal with are Great Blue Herons. Totally different from a Sand Hill Crane. GBH's feed on vertebrates while the SHC is an invertebrate and grain feeder. I have Sand Hill Cranes in the area but have never seen one on the ponds. understood. We have a ton of Blues around here once again. They are very common in lakes areas. Only real predator I know of could be raccoons stealing eggs out of their nests. Supposedly a coyote or Bald Eagle will take them out too but I'm sure that's rare.